This page is all about Hatshepsut and aspects of ancient Egyptian life represented in the Hatshepsut Trilogy. If you have questions about Hatshepsut, or anything else about ancient Egypt mentioned in the Hatshepsut Trilogy, send me an email and I'll try to answer them. If you'd like to know more about the ancient Egyptian civilisation in general, check out these great links. Who was Hatshepsut? What�s so interesting about her? Did you alter history or make things up for Her Majesty the King? The Author's Note at the front of Her Majesty the King says that most of the characters are real. How can you know what people who lived so long ago were like? Who were the members of Hatshepsut's family? Why are there so many conflicting versions of Hatshepsut's family tree? Did Hatshepsut dress as a man and wear a fake beard? A recent TV documentary claimed that Hatshepsut's mummy has been identified, based on a broken tooth. Is it really her? Why did the ancient Egyptians engage in all those incestuous marriages? Didn't they ever notice that incestuous marriages produce deformed children? Who was Hatshepsut? What's so interesting about her? Hatshepsut was a woman who ruled Egypt as a Pharaoh for nearly 22 years, from about 1479 BCE to 1457 BCE. 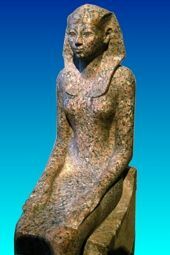 Although in modern times, she is usually referred to as Queen Hatshepsut, she was actually a female king, so we should really call her King Hatshepsut. Hatshepsut was one of ancient Egypt's greatest Pharaohs. Although she was not the only woman to have ruled Egypt as a king, she was the only woman to have done so successfully. Hatshepsut was not Egypt's only female Pharaoh. Prior to Hatshepsut's reign, at least two other women had briefly ruled as female kings: Nitiqret (at the end of the Sixth Dynasty, about 2280 BCE) and Sobeknoferu (at the end of the Twelfth Dynasty, around 1800 BCE). Meryt-Neith may have ruled as king in the First Dynasty (about 2800 BCE), but the evidence is very sketchy. 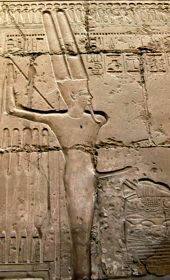 Near the end of the Eighteenth Dynasty (around 1333 BCE), Nefertiti, wife of the heretic Akhenaten, may have taken the throne as King Neferneferuaten, but what really happened during this chaotic period has been a matter of heated controversy amongst Egyptologists for decades. 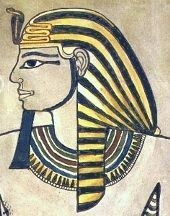 In another period of uncertainty, as the Nineteenth Dynasty collapsed, Tawosret briefly ruled as a king (approximately 1200 BCE). When Egypt's last independent ruler, Cleopatra VII, took the throne from 51 to 30 BCE, the unique Egyptian system of kingship had been defunct for centuries. Hatshepsut was the daughter of King Tuthmosis I and Queen Ahmose. While still a princess, Hatshepsut became the God's Wife of Amen, a priestess who was the most powerful woman in Egypt. She married her half-brother, Tuthmosis, who became King Tuthmosis II when their father died. Hatshepsut and Tuthmosis had one daughter, Neferure. King Tuthmosis II had a brief reign and then died. His young son, also called Tuthmosis, whose mother was a non-royal concubine, became the next Pharaoh, Tuthmosis III. Since the boy was too young to rule on his own, Hatshepsut governed Egypt as regent for Tuthmosis III. A few years later, for reasons no one can explain, Hatshepsut seized power and declared herself to be a king, ruling alongside Tuthmosis III, but outranking him. Hatshepsut was the sole de-facto ruler of Egypt until her death. Only then did Tuthmosis III take up the reins of power to become a mighty Pharaoh in his own right. At least twenty years after Hatshepsut's death, again for reasons no one can explain, Tuthmosis III attempted to obliterate the records of Hatshepsut's reign and claimed all her accomplishments for himself and his father. Fortunately for us, no cover-up is ever perfect. Egyptologists have been able to piece together a great deal of information about Hatshepsut's reign from the shattered statues and defaced inscriptions of her monuments. Hatshepsut herself insisted that she became king from the moment of her brother/husband's death. Although Egyptologists reject her statements, the evidence suggests that her claims should not be so easily dismissed. I tried to be as accurate as possible with everything from the grand sweep of history to the minutiae of everyday life in ancient Egypt. In Her Majesty the King, Hatshepsut's accession to the throne differs from the standard scenario in a single detail, because I believe the standard scenario is incorrect. After making an exhaustive study of the evidence connected with Hatshepsut's accession, I constructed an account of her rise to power which addressed the unanswered questions about her path to the throne and was also consistent with the Egyptian system of kingship. (for more, see Hatshepsut's Path to the Throne) In Her Majesty the King and the other books of the Hatshepsut Trilogy, Hatshepsut gets a chance to tell her version of events, which is the way I think it really happened. Because I was writing about people who lived 3,500 years ago, it was of course necessary to invent conversations, everyday events and some friendships and rivalries. I kept these incidents within the known historical framework. As an example, all the characters who die in Her Majesty the King die at the time when the historical records indicate their deaths were most likely. I didn't dispose of a character when it was convenient or to liven up the plot�no matter how sorely I was tempted to execute the villains! If a character's mummy has been identified, their cause of death in the book is consistent with the forensic evidence associated with the mummy. Ancient Egyptians almost never mentioned a person's cause of death, and mummies don't have intact internal organs, so determining a cause of death is very challenging, but as a biologist who has a thorough knowledge of anatomy, physiology and pathology, I was able to make educated guesses. The death scenes in Her Majesty the King are all medically accurate. In addition, everything done by the royal physician, Menna, is based on actual ancient Egyptian medical practice. The spells he recites are authentic but were shortened from the originals in Egyptian medical texts. I did have to simplify the descriptions of some of the complex cultural practices of the ancient Egyptians, because to represent them in their entirety would have been extremely boring! Real court protocol, for example, involved long-winded speeches and rigid etiquette which modern readers would find stultifying. The religious rituals were also greatly simplified. Actual examples of ancient Egyptian liturgies that have survived are lengthy, full of obscure language and are mind-numbingly repetitive. The parts of religious practice I do describe in the book, such as funerary rituals and the Beautiful Feast of the Valley, are genuine. The ceremony that the God's Wife of Amen performs on the image of Amen-Kamutef was reconstructed from peripheral references to the role of the God's Wife; very few of her ritual duties are explicitly depicted on monuments. We know almost nothing about ancient Egyptian marriage ceremonies, so I invented one for the book. Every human society has some type of formal marriage ritual, so it's safe to assume the Egyptians did too. Besides, they loved a party and I can't imagine they'd pass up an opportunity to celebrate. For some characters, like Hatshepsut and Senenmut, numerous statues and inscriptions have survived that can give us some idea of what they looked like, what they cared about and what sort of public persona they presented. But for most of the characters, very little hard information is available apart from their names and their highest-ranking titles. Often, we don't know all the offices these people held on their way up the career ladder, so in the period of time covered by Her Majesty the King, if characters haven't yet achieved their ultimate rank, they were placed in positions typical for officials advancing to those ranks. For example, it's known that the character, Dedu, was Chief of Police of Thebes. Such men often had a military background and were closely associated with the royal household, so in Her Majesty the King, Dedu holds the position of Captain of Hatshepsut's bodyguards. And although it might seem unlikely that Hatshepsut would appoint a grizzled army general as a baby nurse for her daughter, that information comes directly from General Ahmose-Pennekheb's own tomb inscriptions. Tomb scene showing Ineni (damaged figure, upper left) hunting in the desert with two of his favourite dogs. A tremendous amount of information can be gleaned from details found on the walls of a person's tomb or from artefacts engraved with their name. 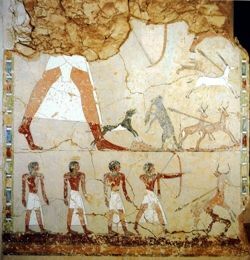 Ineni the architect, for example, clearly enjoyed hunting�his tomb contains a very lively scene of him hunting with his dogs. So in the book he's depicted as a keen hunter. Puyemre's tomb contains scenes showing products of an estate in the marshlands, a detailed depiction of wine-making and men leading horses, which is why in Her Majesty the King, I made him overseer of an estate renowned for its wine and horses. Who were the members Hatshepsut's family? Why are there so many conflicting versions of Hatshepsut's family tree? The historical record from 3,500 years ago has many gaps. In Hatshepsut's case, the task of reconstructing her family relationships is particularly difficult because her inscriptions were deliberately mutilated by her successor, Tuthmosis III. Often, people constructing family trees for Hatshepsut fail to distinguish between established facts (based on evidence from inscriptions or monuments), educated guesses (inferred from known facts) and speculation—some reasonable, some not. In addition, a number of factual errors about Hatshepsut's family regularly crop up on web pages. Hatshepsut's family shown in a relief from her mortuary temple. 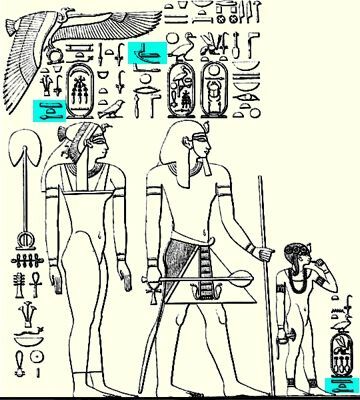 Left to right: Hatshepsut's mother, Queen Ahmose; Hatshepsut's father, King Tuthmosis I; Hatshepsut's sister, Neferubity. The highlighted signs in the inscription mean that these persons were all deceased at the time the relief was carved. Hatshepsut's father was King Ahkheperkare Tuthmosis (Tuthmosis I), the third king of the Eighteenth Dynasty. Her mother was the Great Royal Wife (Queen) Ahmose. Hatshepsut had a full sister, Neferubity, who died in childhood. Hatshepsut had three half-brothers: Wadjmose, Amenmose and Tuthmosis, whose mother was the Lady Mutnofret. Wadjmose and Amenmose lived to adulthood but predeceased their father (Tuthmosis I). Hatshepsut's half-brother Tuthmosis succeeded his father to become King Tuthmosis II. Head of a mummy discovered in a coffin that had once belonged to Tuthmosis I. Although often assumed to be Tuthmosis I, the mummy is that of a young man who was not old enough to have been Hatshepsut's father. Tuthmosis II and Hatshepsut married and had a daughter, Neferure. Tuthmosis II fathered a son, Tuthmosis III, whose mother was the commoner, Iset. The mother of Tuthmosis I was the commoner, Seniseneb. Queen Ahmose was very likely the sister of King Amenhotep I. This would mean that Amenhotep's wife, the God's Wife of Amen Queen Ahmose-Meritamen, was Hatshepsut's aunt and that King Ahmose I and Queen Ahmose-Nefertari were her maternal grandparents. Tuthmosis I was appointed junior co-regent by Amenhotep I.
Hatshepsut was born before her father became Pharaoh. Hatshepsut's daughter, Neferure, died before Hatshepsut. Lady Mutnofret, wife of Tuthmosis I and the mother of Tuthmosis II, probably died before her husband became king. Hatshepsut intended that her daughter Neferure marry Tuthmosis III, who was her half-brother. Neferure and Tuthmosis III were married near the end of Hatshepsut's reign but Neferure died soon after. Barbara Lesko has suggested that Senenmut was Neferure's real father. Tuthmosis I is said to be the son or grandson of Amenhotep I; there is no evidence to support this idea. The mummy commonly attributed to Tuthmosis I is almost certainly not his; the mummy more likely belongs to one of Hatshepsut's half-brothers. Meritre-Hatshepsut is sometimes said to be a daughter of Hatshepsut; in reality, she was the daughter of the Divine Adoratrice Huy. Hatshepsut's mother, Queen Ahmose, is occasionally credited with the title of God's Wife of Amen; she never held this office. It has been claimed that Hatshepsut and other members of her family suffered from a hereditary skin disease. It is more likely that the small bumps on the mummies' skin are artefacts of the mummification process. Tuthmosis II is sometimes assumed to have been a young boy at his accession; his mummy contradicts this assertion. Tuthmosis II is often said to have been weak or sickly. 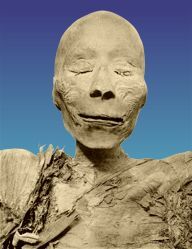 This myth stems from remarks made by Gaston Maspero who said the mummified body of Tuthmosis II looked thin, shrunken and lacking in muscular power. However, virtually all mummies look like that. The out-dated heiress theory—that incestuous marriages took place within the royal family because the throne was inherited via the female line—has been refuted by abundant data to the contrary. Probably not. Popular media often sensationalise Hatshepsut as a cross-dresser, gender-bender or as the woman who donned a beard, but that's simply nonsense. In her public statues and official images on temple walls, Hatshepsut is usually shown as male, wearing the (male) clothing of a king. To the ancient Egyptians (and other ancient peoples), a female ruler was a contradiction in terms, so any image meant to show a king necessarily had to be male. Part of the king's official regalia was the false beard, which was probably made of gold and lapis lazuli, as it is on the famous gold mask of King Tutankhamen. The false beard was attached to the king's headdress by wires which are clearly shown in pictures and statues of most kings. Even kings who are depicted as infants can be shown wearing the false beard, which is surely just as odd as showing a woman wearing it. The fact that the false beard was strictly an artistic convention for Hatshepsut is demonstrated by two of her statues that were probably displayed only in the inner sanctum of her temples. These two statues (one in limestone and one in granite) show Hatshepsut with a woman's body, wearing the king's nemes headdress, but without the false beard. In other words, when she was representing herself as an individual, she chose to appear as a woman. If she ever really wore the false beard, it might have been at her coronation, when a king had to don each piece of royal regalia as part of the ceremony. Sometimes, it is even claimed that Hatshepsut portrayed her daughter, Neferure, wearing a false beard, because Hatshepsut supposedly intended Neferure to inherit the throne as another female king. 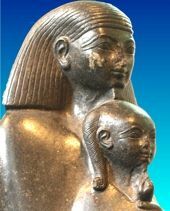 This misconception is based on a misinterpretation of a statue in the British Museum which shows Neferure sitting on the lap of her tutor, Senenmut. Neferure holds a finger to her lips, which is a conventional pose for children in Egyptian sculpture. However, the finger has been damaged so its details are not clear, leading some people to conclude that Neferure is bearded. This error appeared in the original 1934 edition of The Cambridge Ancient History: Plates to Volumes 1 and 2 (eds. I.E.S. Edwards, C.J. Gadd) in the caption to a photo of the statue, and was unfortunately repeated in the 1977 edition, as well as cropping up all over the web. Hatshepsut herself made it unambiguously clear that her heir was her nephew, Tuthmosis III. I don't think so. The mummy in question, formally known as KV60A, and informally called the 'obese mummy', is definitely an Eighteenth Dynasty queen, but Hatshepsut was a king, not a queen, when she died. During the Eighteenth Dynasty, kings were mummified with both arms crossed over the chest; queens were mummified with the left arm crossed and the right arm straight at the side. Mummy KV60A has its arms in the queen's position�what the documentary unfortunately calls the 'royal position'. Hatshepsut's quartzite sarcophagus and matching canopic chest (which contained her internal organs), which were found in her tomb, are inscribed with her titles as a king, proving that she was buried as a king. Hatshepsut's real mummy should have both arms crossed. In addition, mummy KV60A doesn't look anything like Hatshepsut. Although the official representations of Egyptian kings were idealised, certain consistent features can give us an idea of a king's true appearance. Hatshepsut is always shown with a delicate, pointed chin. Mummy KV60A has a robust, square 'lantern' jaw. The so-called 'canopic box' shown in the documentary is actually a small jewellery casket; King Tutankhamen had an almost identical jewellery casket in his tomb. The Egyptians of Hatshepsut's era would never have placed the internal organs of a king all jumbled together in such a tiny box. The box was probably recovered from Hatshepsut's tomb after a tomb robbery; it was then re-used for someone else's burial. The tooth in the box may indeed have come from mummy KV60A, but that doesn't mean that the tooth or the mummy belong to Hatshepsut. If KV60A isn't Hatshepsut, then who is it? There are many Eighteenth Dynasty queens whose mummies have not been identified. In my opinion, the three most likely candidates are Queen Ahmose�Hatshepsut's own mother, Iset�the mother of Tuthmosis III, or Mutnofret�the mother of Tuthmosis II. Perhaps DNA analysis will tell us more, but it would take an unprecedented degree of precision to distinguish either mitochondrial or nuclear DNA from any of the three women I mentioned from that of Hatshepsut herself. In Pharaonic Egypt, incestuous marriages (brother/sister, father/daughter, grandfather/granddaughter) were the prerogative of the king alone. Incestuous unions amongst commoners were restricted to the Greek and Roman eras, as a way of circumventing Greek and Roman laws that made it difficult for women to inherit property. At one time, Egyptologists thought that the right to rule Egypt was inherited through the female line, so a Pharaoh had to marry a sister or half-sister; this notion is called the 'heiress theory.' The heiress theory has been thoroughly discredited, but many books and websites still persist in claiming that a Pharaoh married his sister to 'consolidate' his claim to the throne. Hatshepsut's half-brother, Tuthmosis II, is often said to have married Hatshepsut to strengthen his claim to the throne because his mother was not royal. Statements like this expose a fundamental misunderstanding of the basis of Egyptian kingship. Egyptian kings were considered to be gods by their people. Brother-sister marriage was the norm amongst the primeval gods Shu and Tefnut, Geb and Nut, and Osiris and Isis. All the children of an Egyptian king, no matter what the status of their mother, were considered to be children of a god. When a king married, the ideal partner for him and the optimal vessel for producing his heir was a woman who had also been sired by a god�his sister or half-sister, and occasionally his own daughter or granddaughter. The ancient Egyptians didn't have a clue about the adverse genetic consequences of incestuous marriages. Admittedly, some royal offspring were odd-looking, but their exceptional appearance was considered a sign of divine parentage. Difficulties within the royal family with conception, miscarriages and birth defects were attributed to demons. The deleterious effects of inbreeding are actually hard to observe in a small sample (e.g. the children of a single incestuous couple) and are not as severe as most modern people believe. It can take several generations of repeated inbreeding for noticeable defects to show up. In addition, infant mortality was about 50% in ancient times. Mortality or defects due to inbreeding would be insignificant compared to those caused by infectious diseases, injuries or malnutrition. So the ancient Egyptians would never have noticed any effects of inbreeding, other than the deep-seated repugnance (dubbed the 'yuk factor' by biologists) which seems to be inherent in humans.